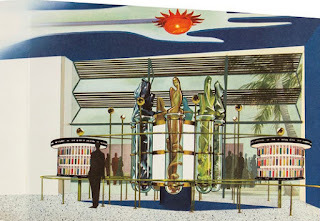 The Chemitron (spelled Chematron in some materials) display consisted of eight, eight-foot high test tubes, each with a 24" clear plastic statuette. Noted sculptor Roger Noble Burnham created the figurines and plastics engineer Glen Kline cast them. 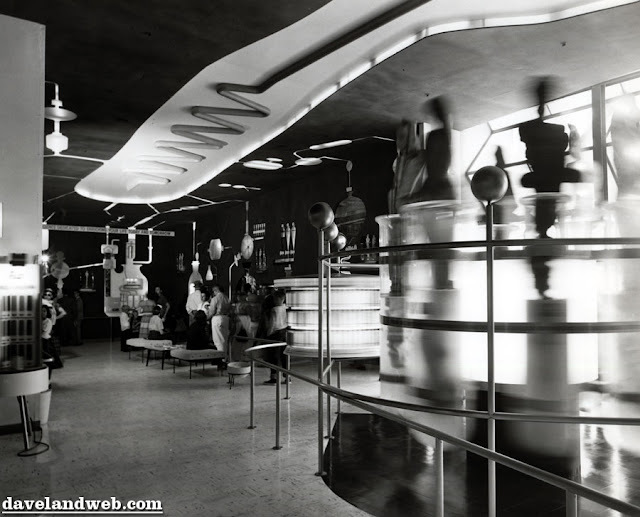 A stylized arm and open palm on the ceiling illustrated a ball of fire in mankind's hand directly above the Chemitron, "symbolizing the processing of chemicals." The name Monsanto is hated in some quarters today for its crop genetics, herbicides and pesticides, but those were in the future in 1955. In 2018, Monsanto is owned by chemical giant Bayer, but then it was still a St. Louis-based, family operation. 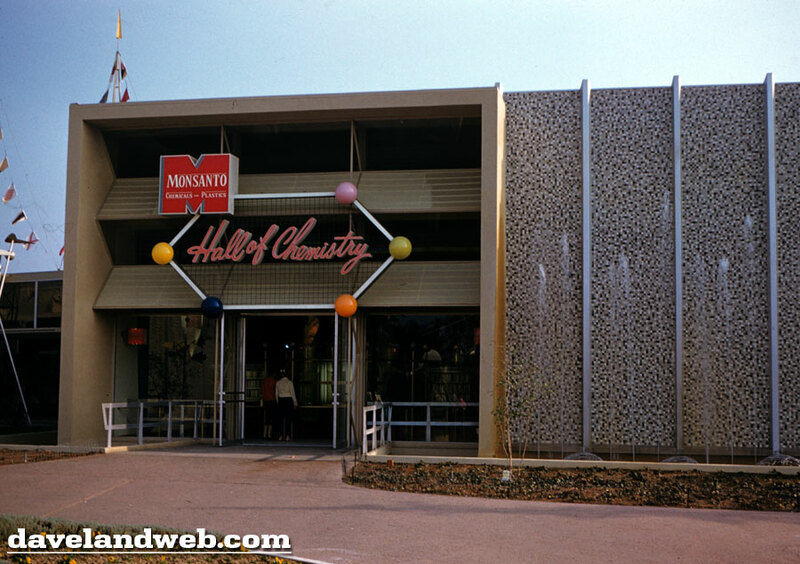 In the fifties, Monsanto's customers were mainly other industrial companies, except for their innovative detergent called "All." Most people knew that Monsanto's Texas City, Texas plant had been obliterated by a huge ship explosion in 1947, at a cost of nearly 600 lives. From the eight common substances on display, Monsanto manufactured almost 500 chemicals and plastics, in 20,000 formulations, as the wall displays shaped like beakers, flasks, and stills explained. Samples of many of the materials were spread on circular racks like paint color samples. Walt Disney was acquainted with Edgar Queeny as an avid naturalist and amateur filmmaker. 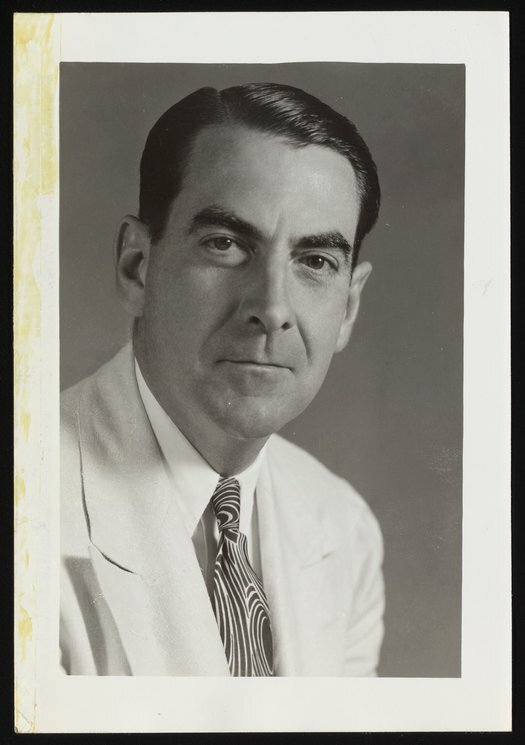 Queeny's film The Lakuto (1951) revealed previously unknown details of an African tribe, and his latest, Silver Lightning (1954), explored the life of Atlantic salmon. Queeny had run Monsanto since Walt invented Mickey Mouse—Edgar's father created the company and named it for his wife, Olga Monsanto. 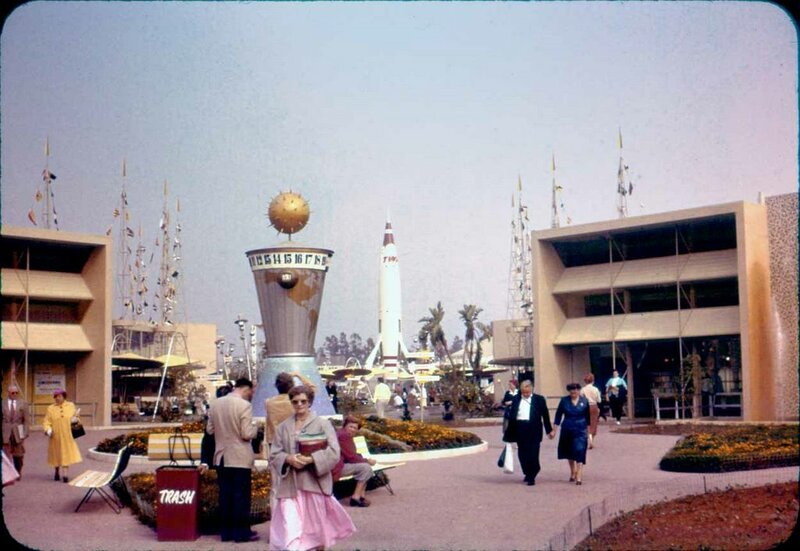 Tomorrowland, added to the opening day lineup a little more than six months before, was dominated by two 30,000-square foot exhibit buildings. Monsanto signed up for 4,000 square feet facing the hub. WED Enterprises was busy with the rest of the park; Monsanto had no educational display staff. There was no time, but Monsanto's reputation was on the line. Enter Bob Henry and Roger Tierney. After graduating Pasadena Junior College in 1937, they went into business together designing, building, and decorating floats for Pasadena's Tournament of Roses parade, held each New Year's Day. By the early 1950s, Floats, Inc. was responsible for 15 floats in each Rose Parade, including floats for the city and county of Los Angeles. Their designer, Ray DuShane, jumped into action for Monsanto. 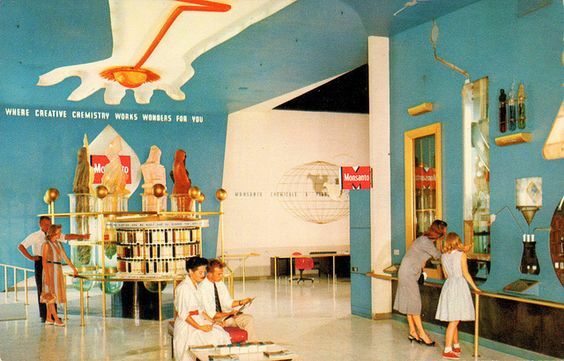 The brightly lit, color-controlled exhibit may seem underwhelming today—we're used to more interaction in our science museums—but it was as least as good as any city's dry-as-dust offering at the time. 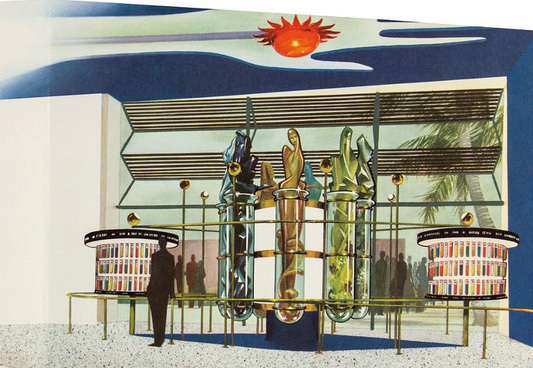 Floats, Inc. would go on to design and build displays for Kaiser Aluminum and other Tomorrowland sponsors. 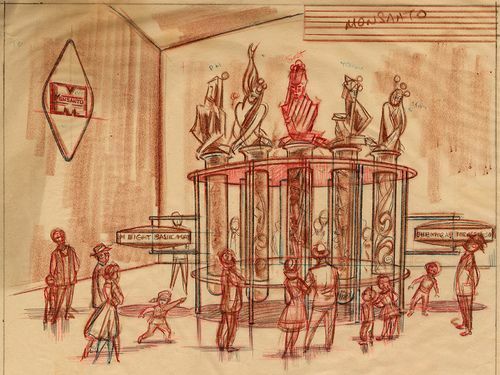 "It is safe to assume that the two Pasadena men have bagged the envious title of 'official exhibit builders' for Disneyland," wrote their hometown newspaper. "Where Chemistry Works Wonders for You"—doesn't that sound like a Rose Parade float tag line? Before the sign was added, the Hall of Chemistry (right) looked just as bleak and Soviet as its twin to the north.